ACCOUNT-BASED MARKETING · 9-MINUTE READ · By Tina Arnoldi on December 19 2017. With Account-Based Marketing, you use a very targeted list of prospects where capturing leads is only the first step in a lengthy process. These initial leads are placed in your marketing automation program where they are nurtured to eventually – hopefully – be ready for a sales call. This nurturing process benefits your sales team because it qualifies people who are truly close to buying rather than spending time on people who have only a fleeting interest in a product or service. ABM is not the right approach for B2C businesses since those products and services are for a wide variety of consumers and generally sell in lower volumes with less money involved in the transaction. It’s a strategy for B2B since marketing is sales-driven from the start. Highly targeted, marketers determine in advance where it makes the most sense to spend time. Account-Based Marketing programs need to always be on since it can take a lot of time to see an impact, especially with multi-million dollar B2B sales, and there are numerous decision makers involved in B2B sales. It’s rarely as simple as a straightforward click-convert. Strategies for B2B ads are different than for B2C ads and several features in AdWords are especially appealing for ABM. Customer Match – Upload a list of email addresses from your CRM and Google will attempt to match people based on their Google account. If your CRM has job titles, you can segment your list with different messages going to IT Managers versus CIOs. Advertisers can increase bids when there is an email match and prospects are searching for specific keywords. Google has since added the ability to target by mailing address and phone which provides even more opportunity for targeted PPC ads. This is an opportunity for advertisers with a small list of email addresses to expand their reach. Gmail ads – While Customer Match is about targeting people anywhere on search, shopping, display, and YouTube, Customer Match combined with Gmail is an opportunity to show display ads in a person’s inbox. Targeting via Gmail is now about the domain rather than the previous targeting method of context. In other words, Google will no longer mine email content to determine targeting. It’s now focused more on characteristics of the audience. Radius Targeting – If the targeted audience is a large company or a corporate campus, everyone within a mile can be targeted through location targeting. This, of course, can include searches from an audience outside a specific company, but it is still a method for potentially reaching people who work for a specific employer. With a Supermetrics template, such us the In-Depth PPC Report, you can see how each of these AdWords campaigns perform over time. AdWords is not the only solution for ABM. You can target traffic through other marketing channels such as email marketing or social media. And yes, there is a place for social media in the B2B world, especially with LinkedIn where executives at targeted companies can be reached. You can match your target companies against the 13+million company pages on LinkedIn and learn more about LinkedIn’s Matched Audiences on Marketing Land. Facebook is a tougher channel because Facebook users may not have their work email addresses tied to their Facebook accounts. If you decide to test it using a feature such as Custom Audiences, review performance data with the Social Media Tracking template to compare Facebook performance to your other social channels. Email is an especially helpful channel for ABM because there is a need to be outbound – not just inbound. Remember, you are targeting people at specific companies rather than only keyword searches or organic posts. Similar to Customer Match, you want to segment your list by job role and department if that data is available and target messaging accordingly. 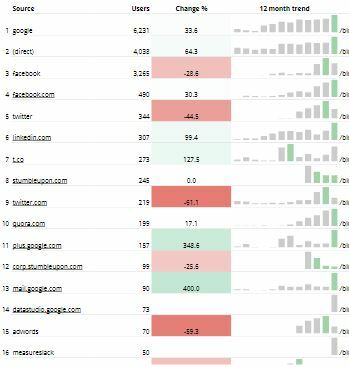 With multiple channels, you can view the performance over time and compare channels with the Traffic Dashboard. With Account-Based Marketing, you have to go beyond the vanity metrics of pageview or click. Examine engagement and the type of engagement. For example, a webinar registration is more valuable than someone who read a single blog post after clicking a link in your email newsletter. And tagging ABM campaigns with a UTM of ABM results in more robust analytics reporting. When it comes time to viewing data in analytics, this tagging is a way to differentiate your ABM campaigns from other marketing efforts. This makes it possible to go even deeper with metrics and re-engage visitors later with a targeted Display Campaign based on their ABM tag. Carefully planning tagging in advance puts you in a better place to move people down the funnel with targeted messages combined with remarketing strategies. Even careful planning and the use of ABM tagging does not guarantee a perfectly clean list. It only works when people click on a campaign to take the next step. If someone reads a message or saw an ad but did not click, he or she will not be placed in your ABM bucket because there is no cookie tied to them. This is why impressions are still a useful metric for the awareness part of branding. Recognize that a conversion in the form of a sale will take time because of the multiple touchpoints. Understanding attribution is important for all channels and you want to give credit to the multiple channels used in the B2B cycle. Looking at only direct traffic conversions – which is less common with B2B anyway – misses out on channels that influenced the opportunity. You can easily calculate the ROI of all channels used and all touchpoints after relevant data is pulled with Supermetrics and create custom metrics in Google Sheets. Supermetrics for Google Sheets add-on offers more than 40+ data sources you can pull your metrics from. The data sources include social networks, payment and analytics platforms, programmatic ad buying systems, and many more. If you want to learn more about ABM and how it relates to inbound marketing, you can check out Hubspot’s guide. Remember that your primary goal with Account-Based Marketing is to find the right accounts – not just individuals – that are qualified and ready to connect with your sales team. As a marketer, your role is to move people through the funnel, expecting that people will drop off. And creating campaigns where people drop off can be good for your sales team. Did you read the quote earlier in this post? 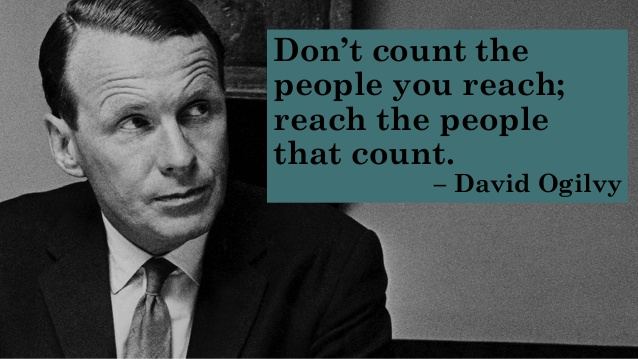 Don’t count the people that you reach, reach the people who count. And when it comes to revenue for your company, not everyone will count.